How intelligent are whales and dolphins? Home > About whales & dolphins > How intelligent are whales and dolphins? 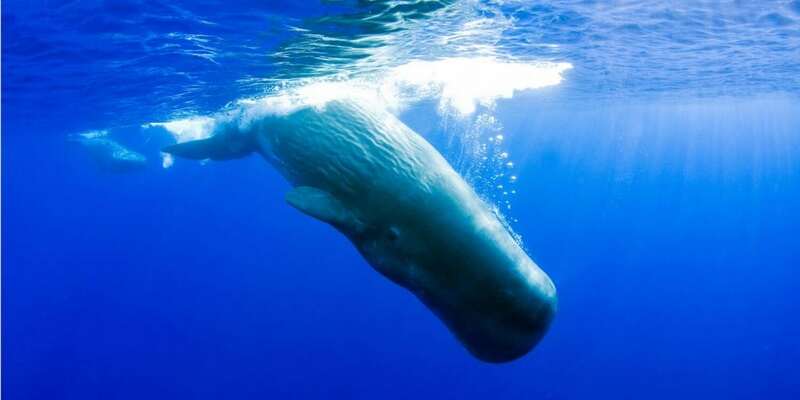 Most people agree whales and dolphins are the ‘brainiacs’ of the sea. Over millions of years, their bodies, brains, sensory systems and intelligence have evolved and adapted for living rich and varied lives in water. These are all very different from our own, yet in many ways they are still more like us than you might suspect. Whales and dolphins behave in ways that suggest intelligence and a sophisticated mind. Not only do they learn as individuals, but as individuals that can pass their knowledge onto others. Intelligence can be defined as the ability to learn and apply knowledge; to understand new or challenging situations and the ability to think abstractly. Dolphins demonstrate the ability to do all of these things and most scientists agree that dolphins are very intelligent. They are notoriously talented mimics and quick learners; they demonstrate self-awareness, problem-solving, and empathy, innovation, teaching skills, grief, joy and playfulness. This short video by renowned scientist Lori Marino, explains how dolphin intelligence evolved. Whales and dolphins have large brains; brainy dolphins have a brain to body ratio second only to humans. Large-brained creatures generally have a few things in common: they live long lives; they are sociable; their behaviour is complicated; females give birth to only a few offspring throughout their lives and take extraordinary care of each baby while teaching them life skills; the youngsters take their time to grow up, become sexually mature and independent of their mothers. 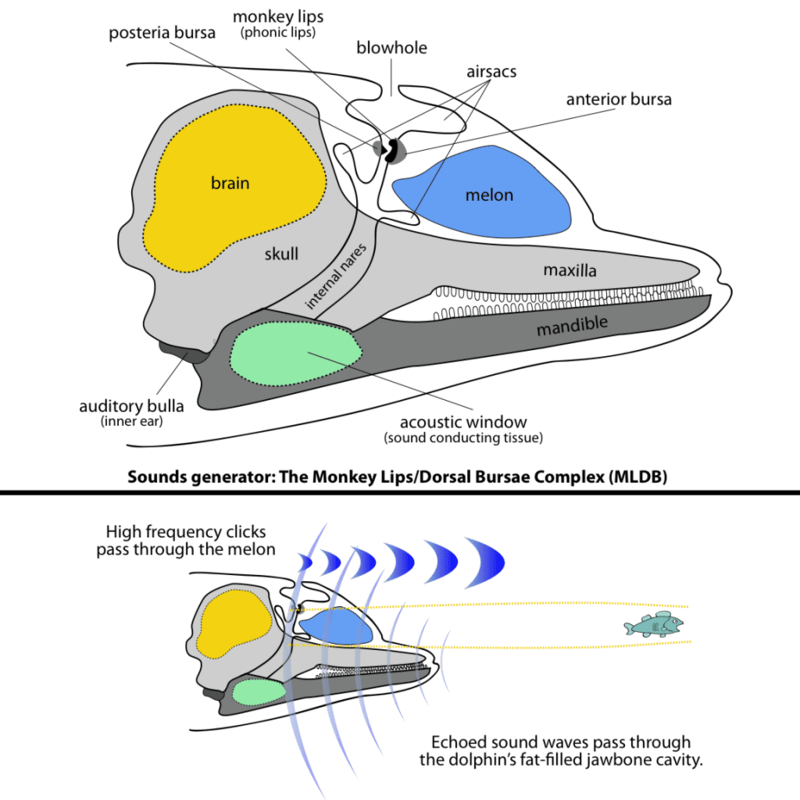 Perhaps the most obvious difference between our brains and that of dolphins and all toothed whales is that they have an entire area dedicated to echolocation. Dolphins can “see” with sonar and this skill or superpower is called echolocation. Sound travels much better in water than light does and so it makes more sense for dolphins to sense their surroundings with sound. Their echolocation abilities are phenomenal; they can determine extraordinary details about everything around them. They use echolocation to hunt and navigate even in dark or murky water. Dolphins can check out each other's pregnancies and eavesdrop on the echolocating clicks of other dolphins to figure out what they’re looking at. It is has been said that play is a great expression of intelligence, and whales and dolphins are gold medallists in this field! Pods of dolphins leap, tumble, back flip and spin together; and there is often no explicable reason for their behaviour other than pure social enjoyment. Dolphins will race towards boats to surf in the bow wave or play in the wake performing amazing acrobatics. Why? Well, wouldn't you if you could? Some dolphins seek out big waves breaking close to shore and ride the waves alongside surfers, other dolphins prefer to play with plants or shells or other make-shift toys. In fact, when it comes to creating games, dolphins know few rivals. Many of them enjoy a game of catch, perhaps with a fish or even a turtle, throwing the animal back and forth to each other. Then there are activities that remind us of our games of tag. One dolphin will nudge another a few times to indicate its willingness for a game, then high-speed pursuit will take place through the sea, as they take turns chasing each other. Some dolphins have teamed up with other animals in the process of play Amazing games between bottlenose dolphins and humpback whales have been filmed off the coast of Hawaii. The dolphins swim onto the nose of the whales, which then raise themselves out of the water to a great height, so that the dolphins slide down their heads with a great splash. As the game is repeated over and again, it seems clear that both individuals are enjoying it. In the wild, whale and dolphin play seems to be infectious, revealing an intelligent brain that needs, from time to time, to relax and let off a little steam. Whale and dolphin communication skills are at the very heart of their cooperative lifestyles and social interactions.. Scientists agree that they communicate with each other in sophisticated and at times, novel and interactive ways. For some, such as bottlenose dolphins and orcas, the complexity of their communication and social interactions is immense; they are incredibly chatty…..if only we were smart enough to solve the mysteries of what they are saying to one another! Here are two great videos of talks by dolphin expert, Dr Denise Herzing on the subject of dolphin communication. Experts have figured out that some dolphin species use distinct names for one another; they are identifiable, individual whistles sometimes known as signature whistles. Dolphins use their names to identify and call one another. Infant dolphins learn their names (individual whistles) from their mothers and keep them for life. 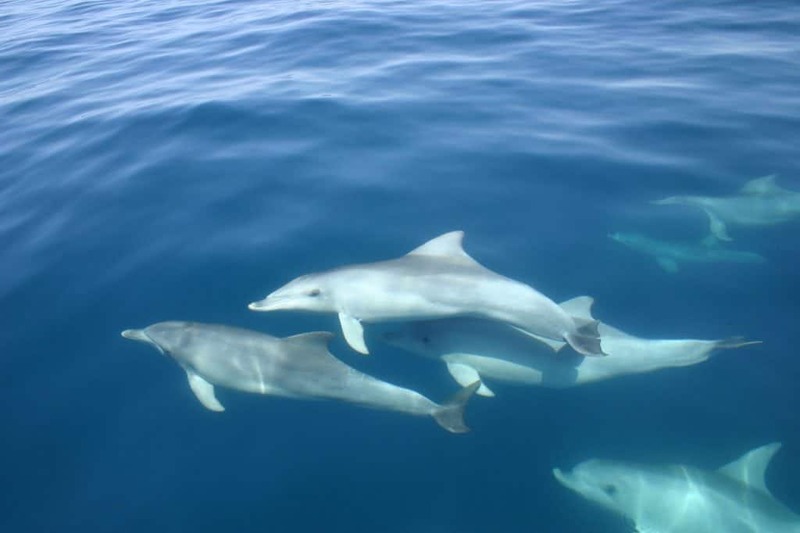 Dolphins greet one another at sea by exchanging their names and seem to remember the names of other dolphins for decades. No other creature, besides humans, is believed to use given names for each other. The ability to recognise yourself in a mirror is often used by developmental psychologists as a measure of intelligence and self-awareness. Dolphins pass the mirror test with flying colours! This skill is rare. Besides humans, only bottlenose dolphins, chimpanzees, elephants and magpies have been shown to recognize themselves in a mirror. Human children start showing signs of self-recognition at about 12 months at the earliest and chimpanzees at two years old. Dolphins recognise themselves in a mirror even earlier, at only seven months old. Dolphins will inspect themselves and look at parts of their bodies in the mirror that they can’t usually see - such as inside their own mouths. They also muck about, twirling and posing in unusual ways, examining their own movements in the mirror. These behaviours indicate self-awareness of a highly intelligent species. Whales and dolphins use exceptionally clever methods to find and catch their prey, and these reveal great levels of cooperation, intelligence and social learning. Bottlenose dolphins in Australia have developed quite a range of tools and methods to aid mealtimes. One group, known as the ‘spongers’ grab a sea-sponge and dive down to the seabed with it. Holding the sponges tightly in their mouths, they then poke them into the sandy seabed, disturbing fish in hiding. The fish emerge, the sponge is dropped, the meal is eaten, and the tool picked up for further foraging. The sponges protect the dolphins’ noses from scuffs, scrapes and stings, in the same way as we would protect our hands with gloves when gardening or clearing rubbish from a beach. Other bottlenose dolphins living in Shark Bay, Australia, carry large conch shells in their mouths when fishing – it looks a bit like they are playing an instrument. The dolphin fills the shell and then visits the surface to shake it so that the seawater drains out, leaving small fish trapped in the bottom. One deft flick of his head and the dolphin has earned himself a tasty snack. The knowledge of these extraordinary and creative fishing methods is passed from dolphin to dolphin. In the shallow waters of Florida Bay in the US, dolphins use their speed, which can exceed 20 miles an hour, to swim quick circles around schools of mullet fish, stirring up curtains of mud that force the fish to leap out of the water into the dolphins’ waiting mouths. Dusky dolphins off the coast of Patagonia herd schools of anchovies into neat spheres and then take turns gulping them down. In several locations including Brazil, India and Myanmar, dolphins have teamed up with fishermen and fished cooperatively together for generations. Shore-based fishermen wait for the dolphins to signal that they have rounded up fish before they cast their nets, the dolphins then easily catch disorientated fish that spill out around the nets. Then there's the bubble net, a neat trick exhibited by humpback whales. 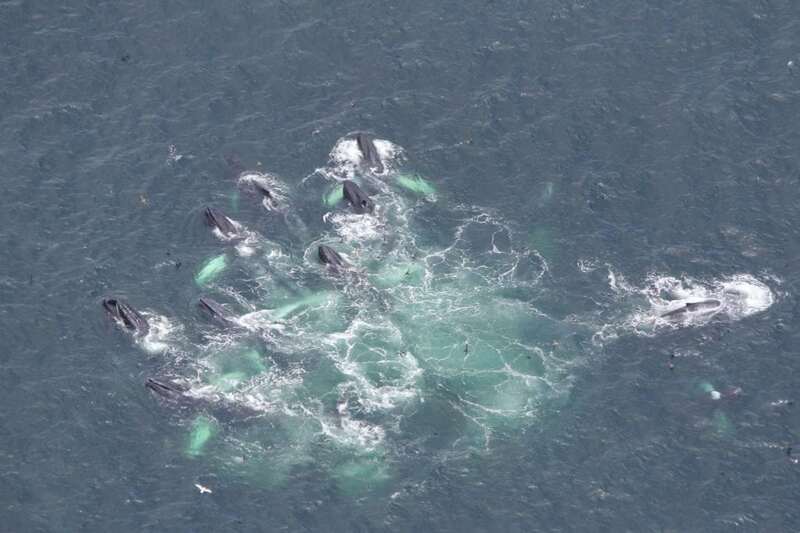 A group of humpbacks locates a school of fish. Attacking them is likely to disperse them, so instead they swim beneath the fish in ever-shrinking circles, blowing air bubbles as they go. The densely packed bubbles rise in similarly shrinking circles, effectively trapping the fish as the 'net' gets tighter, and then at the right moment, the whales swim up the net, mouths agape, and swallow the fish in great clusters. 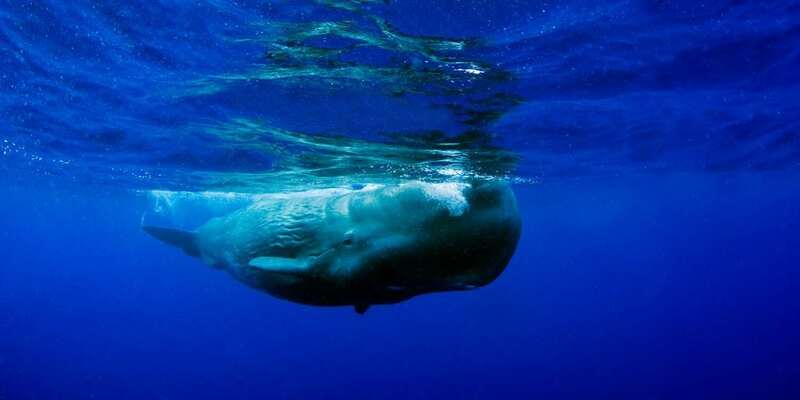 The whales all have different roles: some are bubble-blowers, others dive deep to ensure the fish are driven upwards, and some even make calls to help herd the prey. Teamwork, passed on from generation to generation. Orcas also work cooperatively when hunting; those in Norway, for example, work together to herd schools of herring into tight balls. 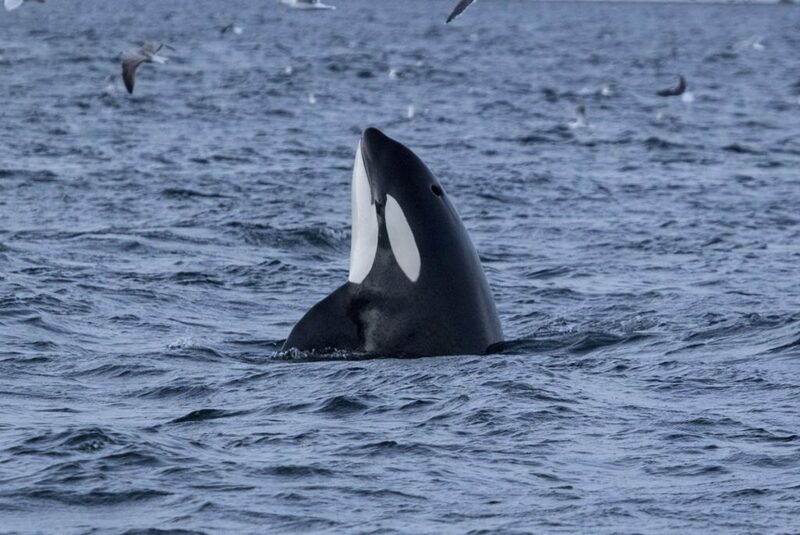 Swimming round and under their prey, flashing their white patches to scare the fish and create a fish bait ball, the orcas then spin around and slap the balled fish with their tails, stunning them for easy catching. Finally, there are some unique examples of social learning and knowledge transfer demonstrated clearly by individual dolphins. The first is Billie. A dolphin who became trapped in a sea lock in the 1980s, she was rescued and rehabilitated in captivity before being released back into the wild just three weeks later. Scientists were amazed to see that, upon her return to the seas, she started tail-walking, a trick taught in marine parks for rewards that she must have observed, even though during those three weeks she was not trained herself. To have picked up the skill so rapidly is one thing… but Billie was soon teaching her wild companions to do the same, just for fun! Then there is Kelly. A dolphin who sadly lives in a research centre in the US, she has been trained to keep her tank clean. Every time she brings a piece of litter to her trainer, she is rewarded with a fish. So she’s built upon the idea. Now, when she finds a piece of paper, she wedges it under a stone, and tears off individual pieces, which she brings to the surface one at a time. Thus, a single piece of litter earns her several fish. She’s also noticed that gulls come to her tank, hungry for fish. So she uses one of her fish as bait, catches the unwary birds, and presents them to her trainers for even more food. She has not only created these remarkable strategies by herself, but she’s even passed them on to her calf. A remarkable example of social learning, and great intelligence. Whales and dolphins are smart! Perhaps we humans need to reconsider the traditional view that we are exceptional and since no other creature can think or communicate like a human, no other species can match our intelligence? The evidence is that – in some ways - whales and dolphins have communication abilities that are superior to those of human beings. Dolphin communication is so great that there is a strong possibility that a dolphin can send a sound image of say a fish to other dolphins. In other words, they can communicate in ways we can’t even imagine. Perhaps one day we will find a way to communicate with the other intelligent beings we share our planet with.